My first year teaching Kindergarten also happened to be the first year that I had ever assigned homework to students. You see, before I began teaching Kindergarten, I taught Pre-K. In Pre-K, we did not give homework. When I moved up to Kindergarten, I had big dreams about the homework I would assign. I’d give out exciting and engaging assignments (never worksheets). I’d provide families with fun learning games that would bring them together. 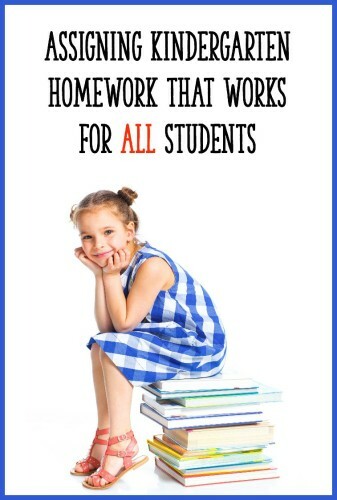 I’d send home different homework for different students, differentiating assignments based upon their needs. I was going to make homework an enjoyable and productive part of my students’ home lives! And then…reality hit. My first year teaching Kindergarten, I had an extremely challenging class. After an 8 hour school day with my kiddos (yes, you read that right – those 5 and 6 year olds were at school for 8 hours a day), I was exhausted. I could barely manage to get materials ready for the next day, much less find or create engaging homework activities. And differentiation? Yeah, right. That year I had students who couldn’t read a Level A book, and other students who were reading beginning chapter books. I would have been up all night trying to get together 25 different homework assignments! Needless to say, my grand homework plans didn’t exactly happen. As the years went on, I slowly assembled a collection of activities to send home. I found and made games, activities, and worksheets to give my students meaningful practice opportunities. But it still took a good bit of time each week to assemble my weekly homework packet. I only believe in assigning about 10 minutes of homework a night, so you’d think it’d be quick to pull together, but it wasn’t! I was eventually able to differentiate homework some of the time, but not as often as I wanted to. I really wanted a set of engaging materials – with a lot of different options – that would make it easy for me to assign and differentiate homework for my kiddos. And then, about 9 months ago, I decided that it was finally time to make the set of materials I’d been dreaming of! I had these goals in mind because I’ve seen kids fail to complete their homework for many different reasons. 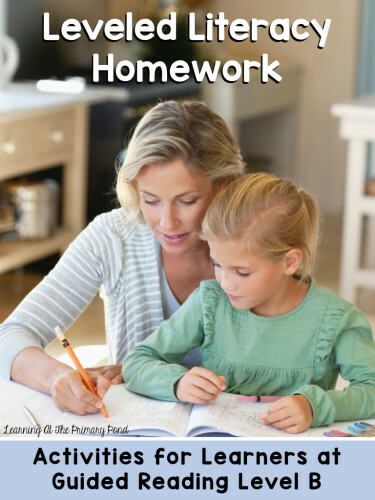 The homework may have been too hard or too easy, parents may not have understood the directions, students may not have had family help at home, etc. And I knew I wasn’t alone in my homework struggles – I’ve never met a single teacher who found it easy to get all of their students to do their homework (even though Kinders are usually super enthusiastic learners!). Homework can be helpful and fun for our little learners, but there are so many challenges to assigning quality homework and then getting it back. While creating my literacy homework series, I came up with some ways to overcome homework-related obstacles. In this post, I’ll share with you the solutions I’ve found to various challenges. Be sure to download all of the freebies, too! Challenge: My kids don’t have the supplies they need at home to complete their homework. Solution: Survey families about their needs several times throughout the year, and provide a take-home bag of school supplies. The more information we have about students’ home situations, the better! Click on the image below to download a free parent survey (in English and Spanish). This survey will give you information about what supplies families have at home. 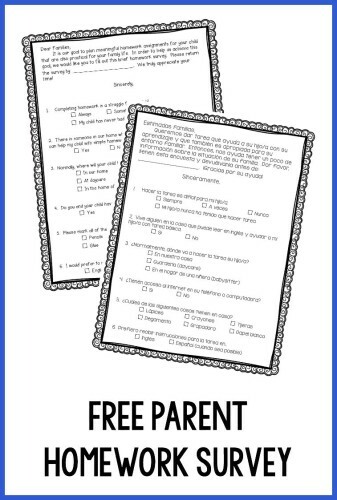 If you’re worried about not getting the survey back, why not have parents fill it out during Back to School night or another school event that most parents attend? Once you know what supplies students do and do not have, you can do several things. First, you can prepare take-home bags of supplies that students leave in their backpacks. Local churches and libraries will often hold school supply drives – if you are in need of duplicate supplies to send home, just ask around! Another option is to be selective about the homework assignments that you give, sticking to assignments that don’t require many supplies. This doesn’t mean that your assignments have to be boring, however! There are lots of interactive activities that kids can do with a paper and pencil. For example, check out this “Super Tic-Tac-Toe” game (download it below). A parent and child take turns “claiming” a space by saying the name of the alphabet letter inside it, and then tracing the missing upper or lowercase letter. Play continues until one person has claimed five spaces in a row. Two different colored pens or pencils are needed- no cutting, pasting, or coloring required! A third option is to give different homework assignments to different kids, depending upon what supplies they have at home. This takes a little time, but my Kindergarten Homework series makes it easy. For example, to have students practice determining whether pairs of words rhyme, you could send home a) Rhyming Memory or b) a “Rhyming Or Not?” worksheet. Both activities address the same skill, but the memory game requires cutting while the worksheet does not. Download the activities below. Challenge: The kids in my class have very different needs, but it takes way too long to differentiate homework. Solution: Keep a file folder for each child with activities appropriate to the student’s skill level. Quickly pull an assignment from the folder when you want to differentiate. 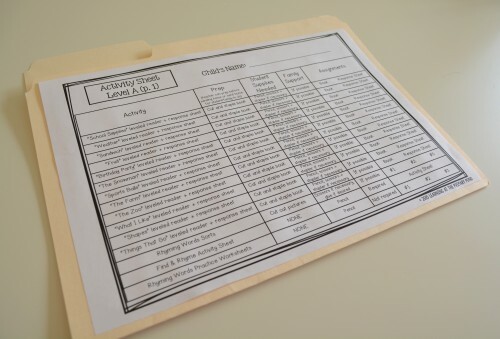 On the outside of the folder is a list of the activities that are at the student’s level. All of the literacy activities on this particular list are designed for students whose instructional reading level is a Guided Reading Level A. Inside the folder are copies of all of the activities on the list. To differentiate homework, just grab an assignment for each child from his/her folder. So quick and easy – and you don’t have to do it for every single assignment. Challenge: I can’t seem to get out of the “worksheet rut” when assigning homework! Solution: Create a weekly “formula” for your assignments. For example, in Kindergarten, you might assign 1 leveled book, 2 family games, and 3 worksheets per week. If you stick to that routine, then you’ll be less likely to rely only on worksheets for your homework assignments. 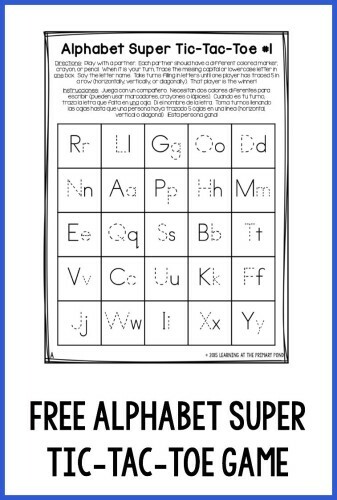 And if you use my Kindergarten literacy homework series, then you’ll have leveled books, family games, and worksheets at your fingertips. There’s no need to waste time searching online or in reproducible workbooks each week! Challenge: My students’ parents are often confused by homework assignments. Some of them don’t read English, so they don’t understand the directions. Solution: Send home assignments that have simple, predictable directions. Spend some time in class teaching students how to complete homework, so that they can teach their parents. Provide visual directions or directions in parents’ native languages whenever possible. Below is an example of a homework assignment that has simple and predictable directions. 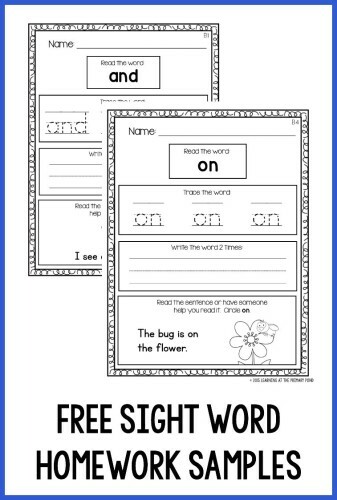 These sight word sheets have students reading the word, tracing it, writing it, and reading it again in a sentence. Each time, the instructions are the same – only the sight words and sentences vary between worksheets. Even if parents can’t read in English, students will be able to complete these assignments if you show them how to do it in class. Another solution is to provide visual aids in your directions, as well as instructions in both English and Spanish. All of this definitely takes a lot of time to put together, but if you use my Kindergarten homework series, the work is done for you! In my pack, each book and assignment (with the exception of simple worksheets), comes with 5 different options for parent direction sheets. You can choose written instructions with or without visual aids, as well as directions in English or Spanish. All parent sheets also come with links to videos that parents can choose to watch. The videos explain the activities and give helpful hints, but families can also just read the written directions if they prefer. Click here to download a sample book and the accompanying parent directions sheets. Challenge: I want to give my students family games and interactive activities. But not all parents are able to help out with homework. Solution: Try your best to involve all families, but if you know that a child has to complete homework on her own, send activities that she can do independently. When creating my leveled literacy homework series, I designed two types of activities for each skill: family games or activities that require parent support, and worksheets that students can complete independently. The rhyming words activities (scroll up) are an example of this. 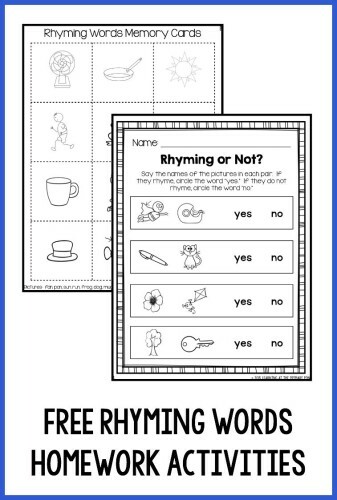 The Rhyming Word Memory game is played with family members, while the worksheet can be completed independently (if students are given the directions at school). It can be tempting to just send home worksheets with all students if some parents can’t help out with homework. But many parents really appreciate interactive materials like family games. If you have a variety of activities available, you can select homework assignments based upon students’ individual home situations. I hope that this post has given you some fresh ideas for preparing homework for your students! Finding materials can be time consuming, but I’ve seen my Kindergarteners benefit greatly from just 10-15 minutes of homework each night. And parents love the opportunity to be involved in their children’s learning! To read more about my leveled literacy homework bundle, click here. You can also click on any of the images below to learn more about the homework activities for Guided Reading Level A, B, C, D, or E.
Can the sight word worksheets be purchased separately from the entire homework series? If not where exactly can they be found? I have a current homework plan and these would fit in nicely with that. Thank you!